This is one of my go-to meals and just happens to be one of my husband's favorites! Broccoli Pasta Bake is a great freezer meal and the leftovers are perfect for lunches. It is also a great meal to bring to a sick friend or someone who has just had a baby. If you are giving it away, try and get the aluminum pans so the receiver doesn't have to remember to give your pan back! 1. Boil the noodles according to the package directions for al dente, I usually cook both together in the same pot. Make sure to salt the pasta water liberally. 2. While the noodles are cooking, in a large pan/skillet, brown your ground meat and season it however you choose. Saute the onion and garlic cloves with the meat. Drain off any fat. Add pasta sauce, tomato puree, some water, and spinach to the meat mixture and bring it to a gentle boil over medium heat. Be careful because the sugar in the pasta sauce splatters. Simmer for a few minutes to combine all of the flavors. Season to taste, remembering you are also flavoring the pasta with the sauce, so it's okay to be a little heavy-handed with the seasonings. 3. For fresh or frozen broccoli, add salt & pepper before it steams. If the broccoli is frozen, place in a bowl and microwave for a few minutes until it is warm. If fresh, steam for 3-4 minutes, just until bright green. 4. Spray your pans with cooking spray. 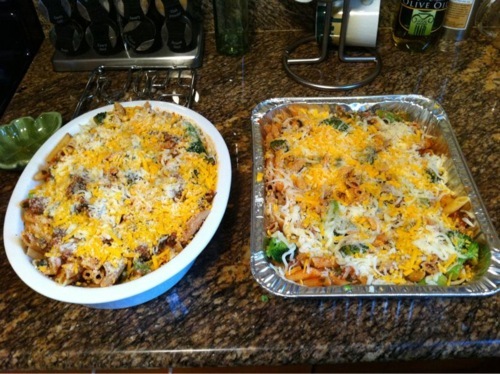 Pour half of the noodles, meat mixture, and broccoli into each of the pans. Stir to combine. Sprinkle the tops of each pan with parmesan & shredded cheese. 5. Bake at 350 degrees covered for 25 minutes. Uncover bake for an additional 10 minutes until the cheese is slightly browned and all ingredients are hot. *If you are freezing the other dish, cover with plastic wrap and then foil. Refrigerate until cooled, then freeze. This helps prevent freezer burn. Write the cooking directions on the foil for easy recall. Baking times may need to be increased. Let me know if you discover other tasty things to put in this pasta bake!